High Quality – Agela is an ISO 9001 certified manufacturer; all of our products are guaranteed to meet our published specifications. Best Value – Our list prices are significantly lower than most other brands on the market. Single Layer Membrane: Single membrane, commonly used, highly cost-effective; newly developed ?33 mm Syringe Filters, with pore sizes of 0.22 µm and 0.45 µm are in stock. Advanced Prefilter: A prefilter before the main membrane, which would avoid the damage to the soft main membrane from larger particles and clogging of the main membrane by colloidal particles, is good for the overall lifetime, process volume, and efficiency. New! Sterilized Filters: Filter the sample with biological activity or aseptic requirements; generally used as a fast, convenient, reliable sterilization and filtration tool in the lab. We supply many kinds of syringe filters, which can be used for filtration of 1mL to 300 mL sample solutions. New! IC Syringe Filters: The Nylon filter membrane is specially developed for IC filtration and is manufactured with advanced technology, with micro-pores evenly distributed with extremely low ion residual, which can effectively filter the particulate impurities. Material, pore size, and diameter are important elements when choosing proper syringe filters; protein-binding should also be considered when filtering the protein-containing solutions. Generally, there is no one type of membrane that can be used for all purposes. To get the ideal result, the proper membrane must be chosen. Broad chemical compatibility (compatible to any common solvents) Low protein-binding; Can be high temp. sterilized repeatedly; Low extractable; For use with high aqueous solution, pre-wet the filter membrane with MeOH, then rinse with DI water before fitering samples. The introduction of extra impurities (extractables) is undesired; we should minimize the extractables during sample preparation. Extractables are often the result of inappropriate choice of materials, improper operation of the device during the manufacturing process, or downstream particle shedding. Particular attention should be paid to potential impurities from the membrane and housing material. The membranes used in Agela’s Clarinert Filters are extensively tested to determine their compatibility with various HPLC solvents. The system includes a borosilicate glass funnel, a sintered borosilicate glass membrane core on the neck, aluminum clamp, and borosilicate glass filter flask. It can be used with or without a membrane filter depending on the application requirement to filtrate organic or naqueous solution. It is also used for liquid degassing. 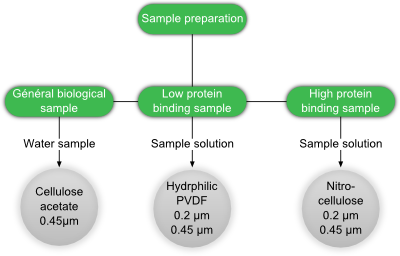 The wide selectivity range of protein precipitation plates makes it possible to supply preparation methods for samples with complex matrices.